Buy 6 white roses inexpensively. Delivery of six white roses 40 cm to Riga, Latvia. ❶ Buy 6 white roses inexpensively. Delivery of six white roses 40 cm to Riga, Latvia. You can arrange a pleasant surprise for your beloved, by ordering delivery of a bouquet of 6 white roses directly to her home in Riga or any other city of Latvia in the best online floristic shop of the capital KROKUS. You can present a gift to your girlfriend on a typical day to express love, gratitude and admiration by buying an inexpensive souvenir, a toy or flowers. That is why the online shop KROKUS is happy to offer all customers affordable and charming bouquets of 6 white roses with delivery in Riga and all over Latvia. With the help of a delicate and fragrant composition you can tell your lady about the warmest feelings, show care and attention. You can supplement six white roses with a postcard, a soft toy, sweets, berries or fruits. Prompt flower delivery in riga at the best price is available for order on the website of the online shop KROKUS. What does 6 white roses mean, delivered to Riga (Latvia)? Six white roses meaning is a mutual and sincere love. This bouquet is usually given to a special person, in whose feelings you do not doubt. 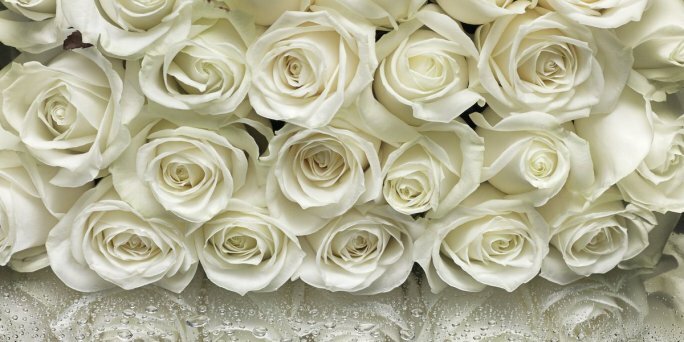 White roses are almost the exact opposite of red, symbolizing fervent desire and passion. 6 white roses meaning is admiration, worship and humility, therefore compositions of this colour are usually given for a wedding. Speaking about the wedding ceremony, it is worth noting that the specialists of the online shop "Crocus" will be glad to help you to complete the image of a beautiful bride, making an individual order of a bouquet of any number of white roses. The wedding composition can be supplemented with stylish decor and accessories, for example, such as textiles, costume jewelry, dressing bands, etc. A purchase roses in riga is the best solution to impress and please loved ones! How much do 6 white roses cost in Riga (Latvia)? Would you like to order a small bouquet of roses? Contact floristic studio KROKUS. Here you can get a delightful composition of the freshest flowers at the best price. So, for example, a bouquet of 6 small white roses 40 cm long will cost for customers only 12 euros. In addition, in our shop you can order a bouquet of almost any size with delivery in Riga and all over Latvia, whether six flowers or even 6 dozen white roses! Just call us at the specified number or use the convenient form of online purchase of a bouquet on our website. Specialists of KROKUS in the shortest time will make for you a stunning bouquet of fresh roses, and our own courier service will deliver it to the recipient fresh and safe.